Fisherman is a crazy-cool bandleader and mallet player (vibraphone, marimba, xylophone) who has been making the hepcats and kittens groove across the nation for over more than three decades. His shows deliver the kind of action not seen since the golden years of bebop, burlesque, and lounge exotica. With his fez, goatee, and vast collection of tiki shirts, he looks like he stepped out of a Technicolor beatnik drive-in extravaganza. Fisherman is the alter-ego of Brian Lease, a classically trained percussionist who exited the stuffy concert-hall to raise the banner of a vaudeville showman. After releasing albums and touring with Frenchy (one of California’s premiere proto-lounge-core acts in the early ’90s), he founded Fisherman’s Famous San Francisco Burlesque, the first live-music burlesque seen on the West Coast. He also co-produced the first Tease-O-Rama, now the largest annual burlesque convention in the world. In New York, Fish played every week with his epiphanous trio at Otto’s Shrunken Head, the hottest tiki bar in NYC and produced his burlesque show at such venues as the Slipper Room, Siberia, and Marquee. 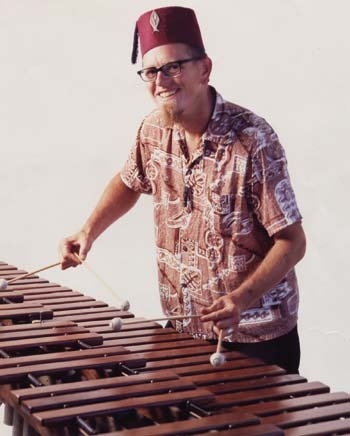 He has performed with legends such as Tempest Storm, Kitten Natividad, and the Pontani Sisters, and continues to travel the world playing vibraphone and drums with his tiki trio. After many years in New York, he has returned to his home of San Francisco, where he plays at such as venues like the Trader Vic’s, the Make-Out Room, the Fireside Lounge, the Hemlock and the Chapel.